With the Viking Cup out of the way the focus turned to the Seniors Trophy which has been donated by Sandy and Dorothy Simpson for players 55 or over. 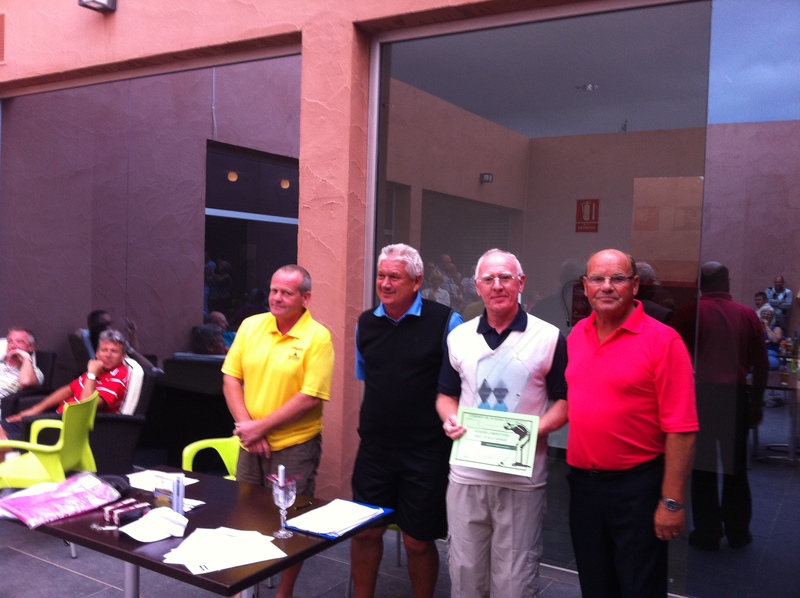 27 players were in this category, with a total of 72 taking part in the individual stableford. Dave Dale took the trophy with 40pts but only thanks to a better back nine than Torild Lailey. The 1st delivery of the yellow society shirts have arrived and were modelled at the presentation by Kim And Kevin. NORWAY WINS THE VIKING CUP !!! 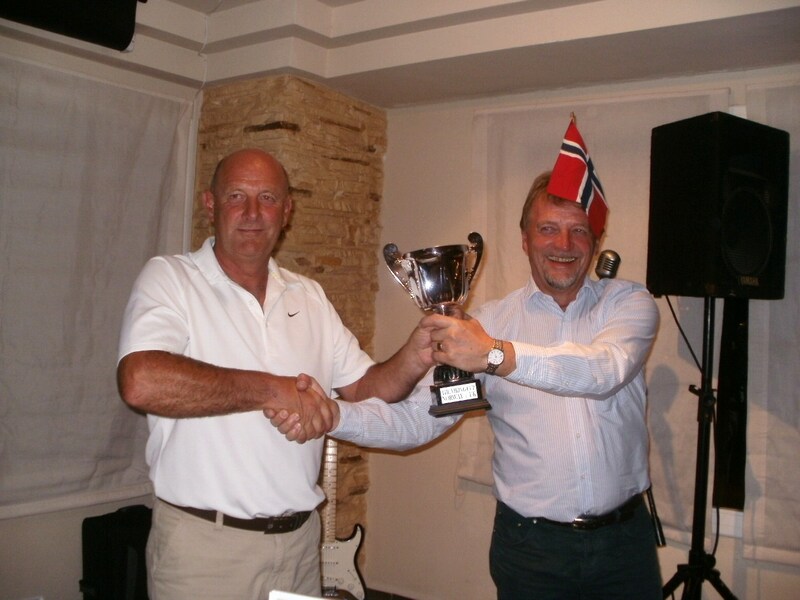 In an extraordinary finish, Norway took the cup from UK in the last match to be completed. UK led by 5 points with the last game to come in, but Kristin Quamme and Eli Holdhus were the heroines gaining 10 points for the win and Kristin’s score of 35 points beat that of Wally Firth by 5 points. It could so easily gone the other way with Mr M Cleary failing to turn up for the UK team. This automatically gave the 10 points to the norwegians, although who is to know if they would still have claimed victory in that match. Possibly equally as crucial was the tied match between Dave Cooke and Andrew Lailey against Birgitte Pedersen and Benedickte Kristoffersen. With a total of 68 points each both teams recieved 5 points in the team competition. Just one more holed putt from the UK and the 10 points (plus the extra point) would have resulted in the UK retaining the cup. Another fantastic day and at night both teams filled the Trevi bar for the presentation with a buffet and music from Buddy Holly to follow. 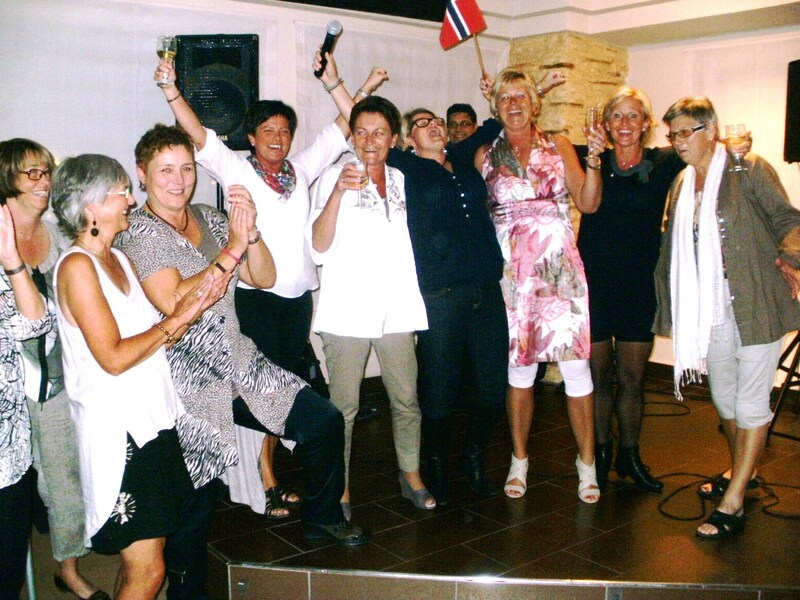 67 players took part and almost 100 were at the celebration party. Thanks to Cath and Kev for making the arrangements, and the organisers of the golf (Dave Lloyd, Graham White, Jan Skjold and Jan H Olsen). Also thanks to Torild Lailey who donated the ladies prizes. I would like to point out though that this has not been an official society competition – it was a challenge thrown out last year (after a few drinks) and its importance has just escalated. 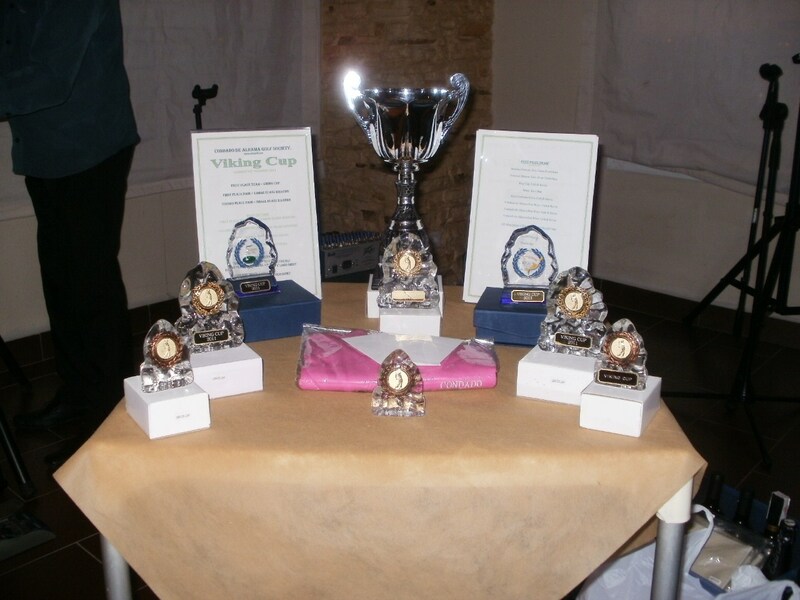 No society funds have been used (trophies were donated), it was played on a non-society day (Tuesday) and team captains were chosed from the players. It may be that this subject may be brought up at next years AGM in March as some society members have strong feelings about being excluded – that is they are not from Norway or the UK. A busy week with the Seniors major trophy up for grabs on Friday. This has been donated by Sandy and Dorothy Simpson and players must be 55 or over to qualify. The clocks go back this weekend so starting times on Fridays will change. We will start from 9am and may also start from the 10th tee so all players can get in before the sun goes down. Again a reminder that all our meetings are now in the Condado Club (jardin 6). Phil has posted an update on the society’s financial position since March – see previous post. Over the past few months the committee have had a few members asking what we do with the membership money, the Society was first created with no membership fee but over time running costs meant that we were funding these expenses from out of own pockets so a small annual fee was introduced. This fee is not only to cover the running expenses of the society but also to provide prizes for major events, weekly free prizes for members, fixtures diaries and other items that will be of benefit to the entire membership. 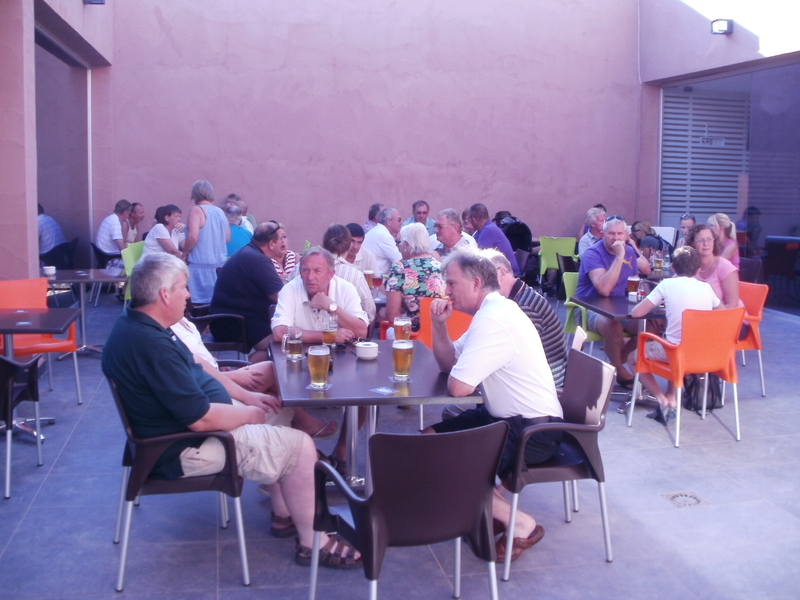 At only €5 a year this would be recovered the first time a member plays and they would then have all the benefits of membership such as reduced rates both here at Condado and also at Hacienda del Alamo. 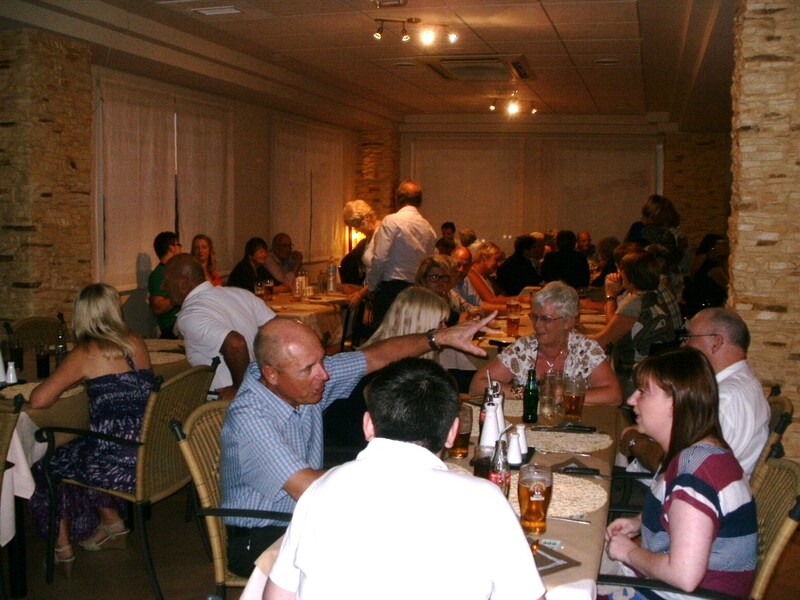 Membership also allows them to attend the many social events that the society hosts throughout the year. In the first year we had some 400 golfers play with the Society but since March when membership was introduced the Society has grown from strength to strength with just over 700 fee paying members bringing in some €3500 in membership fees. Each week the committee produces the tee time sheets for the Monday, Wednesday and Friday competitions, these plus the up to date membership lists and winners certificates all amount to a high printing cost in terms of paper, card, ink and lamination. Weekly results are then posted on the Society website, which again has an annual cost. In the six months since March these running costs have totalled just over €630 or around €100 a month which is pretty good considering the size of the Society. As those members that were able to play in yesterdays Viking Cup will of noticed we have also purchased a Gazebo which will be used as a refreshment tent in major competitions to provide members a little shade at the 18th to enjoy a post game drink. Since March we had held a number of major competitions as well as the normal Friday game, at all of these events additional prizes are presented to the winners over and above those covered by the entry fees, there is also a free members draw where Society Shirts, hats, towels, balls, pitch repairers etc etc have been presented, these prizes total just over €1060 from society funds. I’m sure all members will remember the terrible earthquake in Lorca this May, the society held a Charity competition to help raise funds to support the victims. All the entry fees were donated and the total doubled from society funds allowing us to present the fund with a cheque for €300 from this one event. In September the Society Fixtures Diary was produced, which gives all the dates of the Major competitions for 2012 as well as the format for the normal Friday game. These cost €855 to have printed and will be given free to all members. Of course the committee does not rely on membership fees alone and we actively seek sponsorship for major events and advertisers for both the dairies and websites. These activities are bought in an additional €680 into the society funds. The aim of the committee is to ensure that the society funds are spend in such a way that all members benefit, we are planning ahead to that happy day when we have a permanent club house so rather than spending all the funds raised we are building a small reserve that will enable us to purchase such things as a trophy cabinet, honours boards etc to fit out the society room. Until a club house is built, which could still be a number of years, these could be housed at the Condado Club which has become the current home of the society for it’s weekly meetings. The full accounts will be presented at the society AGM in March, but if you have any queries then please contact a member of the committee. It was great to see two of our society ladies (Roisin Kerr and Benedickte Kristoffersen) take 1st and 2nd place in the ladies section. 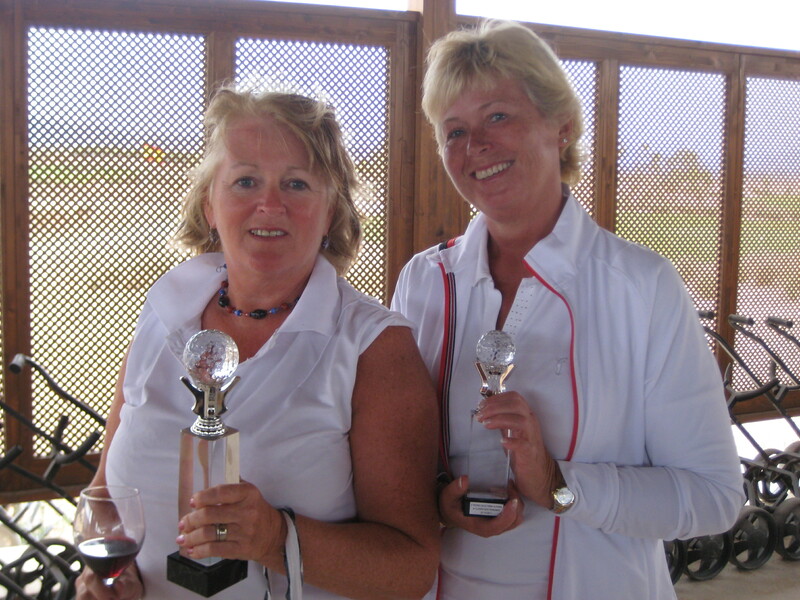 Both ladies tied on 36 pts but Roisin triumphed thanks to her lower handicap. The weather has changed and I think autumn has arrived. Temperatures are down to a pleasant 23 degrees with some cloud cover. My norwegian partner started with a waterproof jacket and long trousers but I was quite happy with a polo and shorts (he did start shedding by the 9th hole). Again a fantastic turnout of 68 players which is the second best ever, but also 50/60 is the norm lately. There were again some great scores in the 1,2,3 waltz competition (the first time we have tried this format). 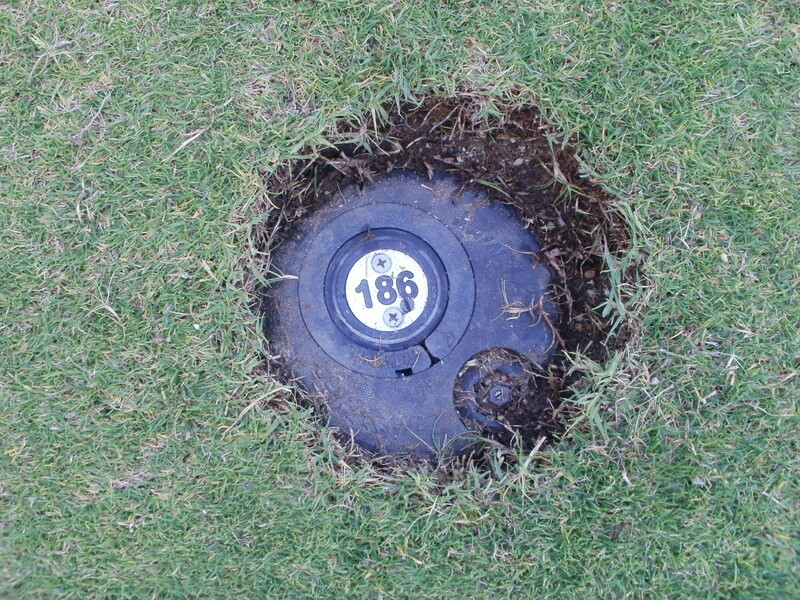 With only a maximum of 3 players counting at a hole this took some pressure off the golfers. Our team however tried the wrong dance and I think we did ‘The last tango in Paris’.(confused). Most of the other teams were bunched beteeen 85 and 88pts so it was a good format closely contested by all. 6 prizes were given out in the free draw for non winners who had to be present. Next Tuesday is the competition between Norway and the UK which is just a challenge match. Sorry to anyone who feels excluded but the society will back any similar challenge matches (e.g England v Ireland?). 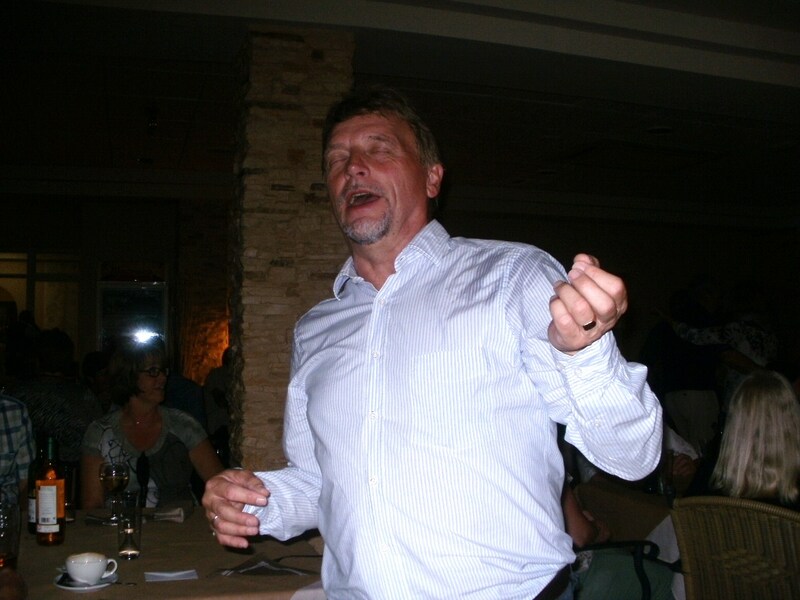 The golf presentation at Trevis on Tuesday will take up perhaps 30 minutes, so any non players should join us in a great night out with a hot and cold buffet, entertainment by Woody (Buddy Holly) and dancing. Cath does a great job arranging these functions so come and join us. We have a bus booked to run us there and back. It is all about making friends and having a good time. A very busy week with the Sandy Simpson Seniors trophy to follow on Friday. This is for players who are 55 or over and can’t compete with the young guns who smash it 50 yards+ past them. 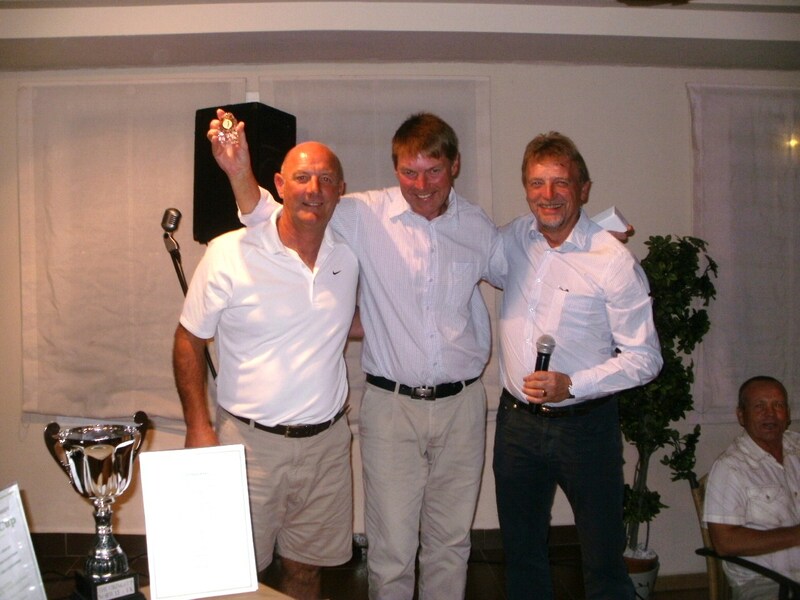 It will be combined with an individual stableford for all where the old ‘gits’can win both prizes! This week Phil Marlow has brought us samples of the society shirt for next year. Various colours are difficult to control for Cath & Kev so we have decided to have a team colour for 2012 – sunshine yellow. Various sizes will be available at a very reasonable price. Also we are looking at providing high quality golf caps which will match the shirts. I have updated the fixture list for November and December on the website (see tab fixtures) and please see Phil Tann for your diary/fixture list for 2012. Another great turn out for this month’s individual stableford competition sponsored by Apollo Air. 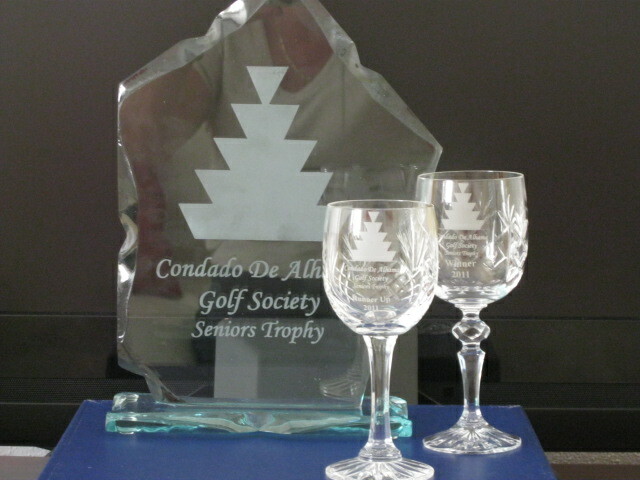 They have donated a trophy for the 1st individual competition each month for the next 12 months. 63 players this week played in slightly cooler conditions with some cloud cover. With so many golfers we had to operate a 2 tee start with some starting at the 10th so we could all finish in time for the 5pm presentation. Just a reminder though that players playing their 1st competition with us need to bring a handicap certificate from their own club in order to win a prize. One of the main prize winners had to go back to Camposol to get theirs, whilst another minor prize winner was unable to produce one. Lots of players returned scores below their handicaps so it has kept me busy this week adjusting them all! This week we had the presentation at the Condado Club (Jardin 6) and it was a great success, with about 80 golfers and friends attending. Thanks to Neil, Paul, Lynne and Rachel for bringing the opening time forward from 8pm so we could be the first into Condado’s new bar. They did a great job under difficult circumstances with no till and acts cancelling etc. 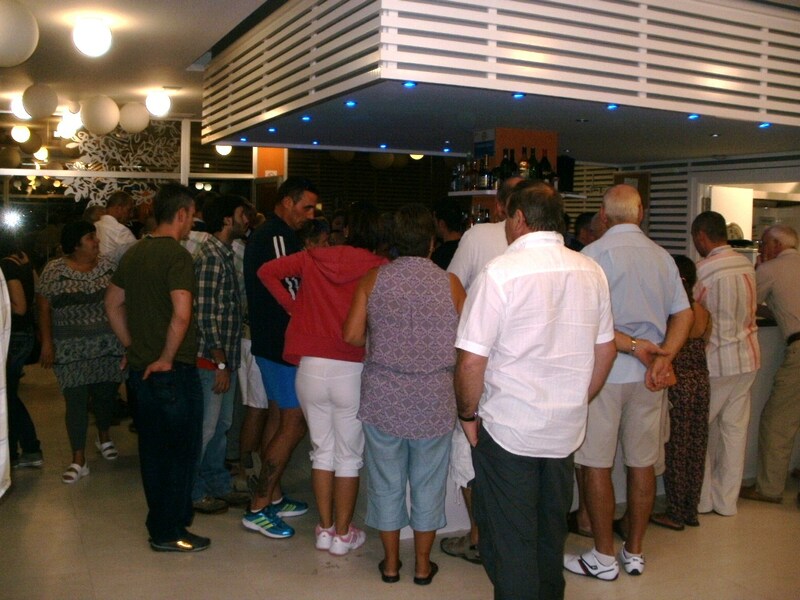 By 8pm the bar was nearly full in the 4 different areas, and later on as you would expect queues formed around the bar. There was a duo performing in the function room and a great free buffet was provided. It was also nice to see so many there on Saturday afternoon watching premiership football. It was good not having to trail to Camposol and watch the football and alcohol levels! In saying that though we have been very grateful to the Camposol bars being there for us while we had little service and no choice on site. It was interesting to hear that while the Condado Club was bursting at the seams there were just 6 people in the Clover! Next week the Wednesday night golf meeting will be at the Condado Club as our new headquarters. An unbelievable entry this week of 76 players – another record after the ladies entry last week set their own record of 15 players. So 19 teams in the popular format of a 4 person texas scramble played in perfect golfing conditions with some cloud cover to cool the day down. Chris King, Bruce Hornsey, Kjell Munheim, Barry Barker. I was lucky to play with players on form as I struggled off the tee, but fortunately holed a few putts on the back nine. With 9 gross birdies and 8 pars things looked good on the 18th tee. Kjell had to get his 4th drive in and played conservatively onto the fairway. However I was the only one to threaten the green with the 2nd shot, but my 5 iron just caught the bank of the bunker 2 yards short of the green and rolled into the sand. When we dropped our only shot I blamed Kjell. If he had hit his drive 2 yards further we would have had a tap in birdie! It seems there is some doubt who will be running the course next month. We are unable to arrange a meeting with the management until it is decided (perhaps in November) who the management company will be. Next week it is an individual stableford and the start sheet is already full from 08.30 until 11.40. So I have booked more slots starting at the 10th tee from 09.50. 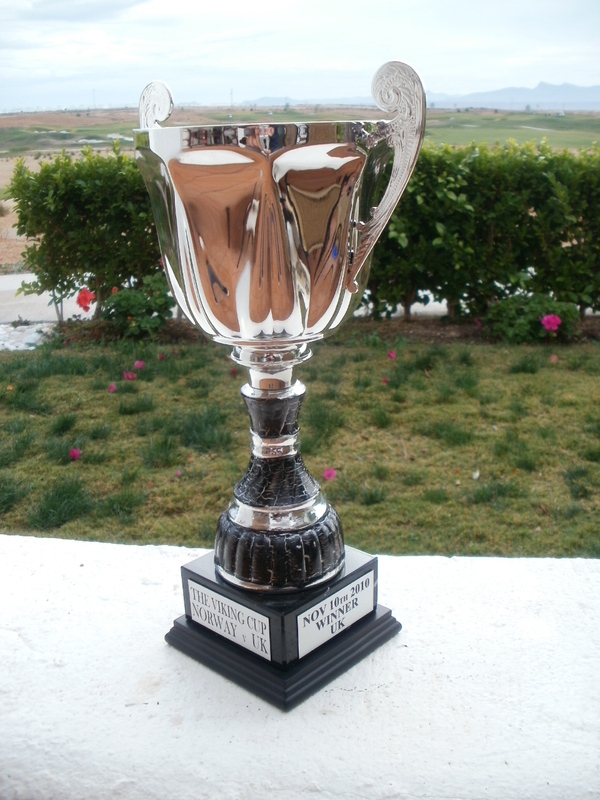 This will be the first stableford of the month, so we are playing for the Apollo Air monthly stableford trophy. Apollo Air have provided us with 12 momentos to play for over the next year. This will go to the player with the best score on the day. 1st division, 2nd division and ladies prizes will continue alongside this special prize. Apollo Air provide high quality air conditioning units at a variety of prices. Also they are renowned for their after sales service which cannot be said of some of their competitors. At the presentation I informed the players that I would reveal surprise news in this blog. 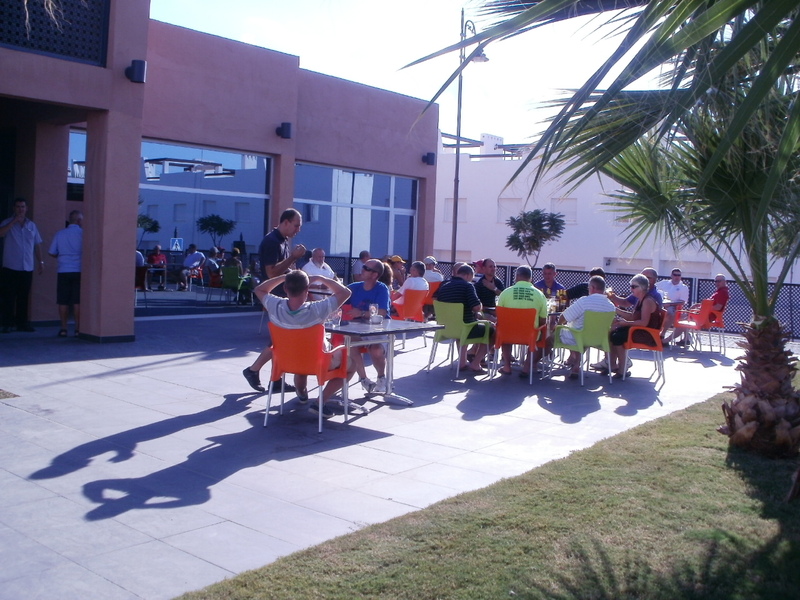 Well, the good news is that from next week the society will be based at the new bar by the tennis courts – The Condado Club. Neil and Paul have made a fantastic job of transforming the old ‘Surgery’. Plans are afoot to provide us with our own noticeboard and trophy cabinet just inside the main entrance. We shall have the Wednesday night meeting and the Friday presentation there, and 3 large screen televisions will provide sports coverage. There is also a function room which will hold up to 150 people and an separate games and play area for children. The owners are open to suggestions to give customers what they want. 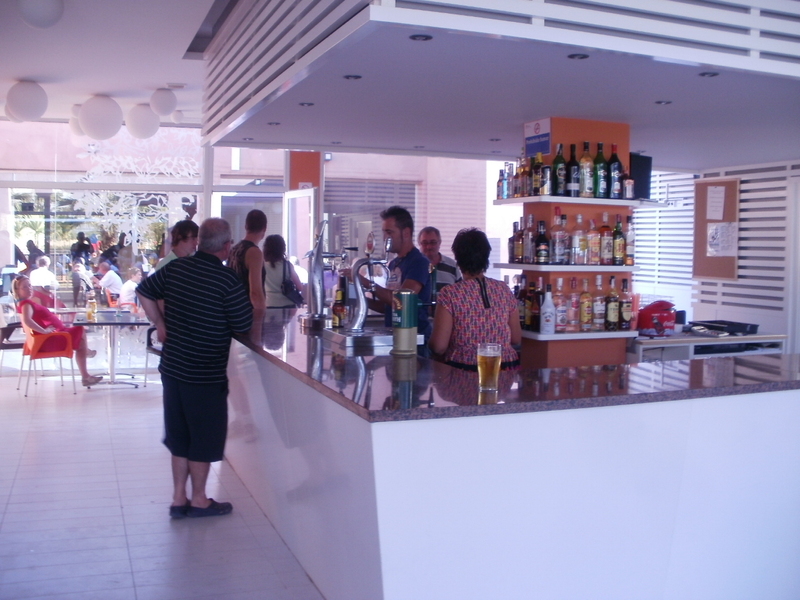 It will not be an english bar – it is hoped to cater for the spanish also. Amstel will be 2.40e, San Miguel 2.50e and english draughts at 2.80e and a selection of tapas will be available, as well as other snacks. This is what the community needs – choice. With the society moving to our new base, and the Viking Cup and the Simpsons Senior Championship the following week, entry records being broken every week, these are exciting times for us.